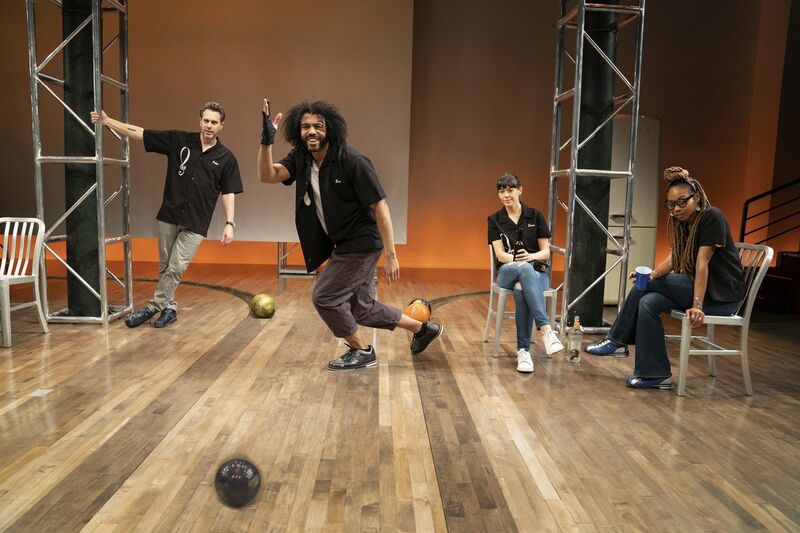 (Left to right:) Thomas Sadoski, Daveed Diggs, ZoÃ« Winters, and Sheria Irving in "White Noise," through May 5 at the Public Theater in Manhattan. In a recent interview in Playbill, Suzan-Lori Parks, speaking about her new play, White Noise, premiering at the Public Theater, was quoted as saying, “I ask big, 'cause I’m Suzan-Lori Parks. This is what I do.” After gasping at the sheer chutzpah of such a remark, I have to acknowledge that she’s right. White Noise asks big. Very big. It is descent that is the crucial word here, suggesting the historical determinism that, for Parks, burdens us all: “Racism is a virus. And we’ve all got it.” There is, too, the psychological determinism of the parents who raised us. We learn that the artist Leo (Daveed Diggs, in a mighty and stunning performance) had a conventional childhood. Crucial to his life is his torturing insomnia (consider this in relation to being “woke”); the only solution has been a “white noise” machine that allows him to sleep but prevents him from making art. “Black noise,” we will be told, is “silence.” The Church Lady he relied on as a boy taught science at his school. Contradictions abound. Leo’s partner at the moment (these four old friends have mixed and matched their relationships) is Dawn (the excellent Zoë Winters), a lawyer raised by parents who are both psychiatrists (“Both!”) and so desperately needs to be a “do-gooder” that she will betray her professional principles. Misha (Sheria Irving, in a very courageous performance) misleads us, as she does the call-in audience of her cable show, Ask a Black, which painfully and hilariously parodies the public. Her parents, two moms, are both professors. Ralph (Thomas Sadoski, bravely and impressively representing the ugly complexity of being a white man) is a trust-fund kid who, we will learn, grew up poor. Daddy issues. Two events have happened before the play begins: Ralph has been denied tenure (consider this in relation to slavery and freedom) and Leo has been roughed up by the police while walking down the street. The action of the play is launched by Leo’s idea: He will become Ralph’s slave, a deal sealed with a contract (drawn up by a lawyer who specializes in pre-nups — implying the marriage contract is a variant on slavery) and thereby gaining the freedom of being under a master’s protection. If the social contract has been broken, as we frequently lament, White Noise literalizes that contract. Act 1 gives us social interraction; Act 2 gives us monologues so that each point of view is amply and intensely presented. These solos are so eloquently written, so beautifully delivered, that we are startled by one insight after another, awash in both sympathy and guilt and anger. Oskar Eustis directs with masterful hand, meeting every theatrical demand Parks’ script places on him. Clint Ramos’ set design even manages to place a convincing bowling alley on the nearly bare stage. To say more would spoil the plot’s revelations. Enough to say: Go see it. Through May 5 at the Public Theater, 425 Lafayette Street, New York. Information: 212-967-7555, publictheater.org.